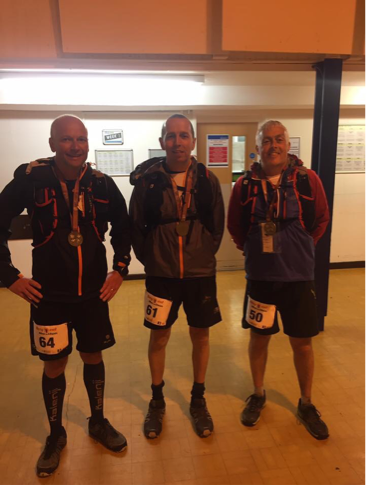 After only completing 3 of the 4 loops last year myself, Paul Spriggs and Lee Rudd were determined to complete all four loops this year. Apocalypse 50 is a 50 mile ultra marathon over the Church Stretton hills. As I’ve mentioned there are 4 loops, each one starting and finishing at Church Stretton Secondary School. The loops are named Death, War, Famine and Conquest and you can choose which order you do them in. There is a total of 10,000 feet of elevation. We decided to take a more sensible approach this year. Not only with the order we did the routes but also combining more walking with the running and saving the running only for the flat and downhill. The race briefing started at 7.30am so it was an early start. The weather at this point was dry and we set off at 8am. The good thing about this race is that as you come back to the school you only need enough food and drink for the loop you are doing. This was a good thing in Lee’s case as he would have needed more than a rucksack! The first 14 miles were done without any problems and we were back to get our book stamped. All three of us felt good at this point as we set off on the second route. Again this one went without any glitches. It had rained and so I changed in to some dry trail shoes and Paul and I had a quick bite to eat. The race organisers, Beyond Marathon, put food on at the school (included in the entrance price). Lee came out to join us for the third route with a pork pie in his mouth and a hot pasty in his hand – he had also just consumed 5 glasses of coke for energy! Not long into the route I turned around to seeLee devouring a pot of tuna pasta salad as he was running up through Cardingmill Valley. I asked if he going to be alright after all the food and coke – he replied “We’ll soon find out.” He was absolutely fine. The third lap was when the challenge started to take its toll on our legs and started to test our mental state. Lee kept both Paul and I motivated to complete this loop. Back to the school again after 42 miles. We had saved the shortest route for last (Conquest) – however it is not the easiest as it has Caradoc in it. Even with fresh legs this takes some getting up. It started to pour with rain so for the first time in the day we put our waterproof coats on. We knew once we had got up Caradoc and past 3 Fingers we only had two miles to go as we punched our card. There are a number of checkpoints with different shape punches that you have to find and stamp your card – these get checked after each route to verify that you have done them. Even though I only had two miles left I was not sure I could complete. The previous 48 miles had taken their toll on body and mind. Again Lee gave us the mental encouragement to finish. The school sign for the last time was very welcome. We had done it! Superbly organised event with clear instructions. The food at the school is great – all dietary needs are catered for. Lovely medal at the end. I would recommend if you are thinking of doing an ultra-marathon to do one of Beyond Marathon events. Big thanks to Paul and Lee for getting me around. My next ultra is Snowdon Quarter with Paul which is 42 miles up and over Snowdon which I’ll be doing for charity. 2 fast 2 flat is a new race for 2017 on an out and back course offering 5 or 10k distance. I signed up awhile ago and Donna Howells and Sally Withington decided to join in the fun a few days prior to race day. Not paying much attention I hadn't realised it was the Newport to Stafford track which many of us have encountered during marathon training at various times with less than fond memories! The start was about a ten minute walk from registration where due to them having to move their van and reset up we were told there would be a brief delay. So back to registration for the obligatory pre race toilet stop. I can't really say much about the route itself, it had recently been resurfaced so offered a good level trail and you have trees and fields either side. The turning points for the different distances were marked on the path and I knew when I got to the 5k I wasn't going to get my hoped for PB. There is a very slight uphill on the way out meaning the way back was a little kinder though it didn't feel that way. Mick popped up from the bushes to cheer us on having decided last minute to run but sadly missing the start. It was a nice boost as there were no supporters apart from those running the opposite way who were all very friendly. I made the course over at 6.31 miles, Donna made it 6.27 but Sally's watch showed 6.2 so no idea if it was long or not. Nice medal and chip timing and I'd entered early so at 11 pounds a reasonable price. I had the pleasure of the company of Deb Millington for the trip to Dolgellau,Wales.This was Deb’s first experience of the race and my 2nd (2014 first one).Arriving with plenty of time we collected our race numbers, Buff memento and did the usual loo stops.With the race starting at 1.00pm we were at the start at 12.50pm. This being WFRA registered event the rules are that full kit is required. Waterproof/wind roof jacket, Waterproof trousers, whistle, compass and a map of the course.Before you can start your kit is checked – no kit = no race.Starting in the town centre you head out straight up the road for about a mile and a half. Turning left you then head along a forest path by the lake. Over a style (bit of a queue here).Out over a boggy field and another style and on to a lane before the real tough stuff.You head up at this point, and up, and up. Running was at a premium here so head down and keep walking.Deb and I had agreed to do our own races. I went off reasonably hard and Deb started gently.Halfway up the first climb of many, a tap on my shoulder, a smile and I was eating dirt as Deb went by. Apparently Deb thinks she isn’t fit at the moment, yea right.The route is made of three false tops, just when you think your there it goes on and on.The leaders start coming at you from the direction your heading and wow can they run. bounce, jump and leap to the bottom.The cloud dropped as you neared the top so vision was at a premium as you scrambled over the rocks to touch the trig point.You turn around and back to where you started. The downs are nearly as hard as the ups to be honest as your quads start to feel painful. The beauty of a reverse route is knowing the last mile and half is downhill as shown by the difference in my mile times today as they went from a 6.41 to a 22.00 JI got passed by many on the way up but only managed to get a few of them on the return trip – must train harder.Back to the finish line with a time of 2.09 which was a minute slower than 2014.Deb was waiting there with the biggest grin you have ever seen and no surprise with a time of 2.03. To say she enjoyed it would be an understatement. We had a cup of Tea and sandwich which were supplied at registration before heading back to the car. Odd moment of the day – The sandwich was half brown and half white bread? ?As we headed back to the car and then a toilet stop I caught Deb skipping like a little girl. She was that excited at her time and the event. Brilliant run Deb and thanks for driving. Awesome race if you like big ups and big downs. You add these races to the calendar and before you know it there only a few days away. Mine was a day earlier than I thought as I had it as being on a Sunday – oops. ​Having picked up Chrissy and Sally we (Susan Gill - chief photographer) we were off. Chillington hall is not far away from a village called Brewood – This is pronounced Brood apparently as I have been told many a times by people locally born. That said a Hall you would think would be sign posted quite well? Err no. Sat nav Sally got us there with lots of time to spare. Collect chips and numbers followed by toilets and wow 50 mins still to go. The race starts on the drive and headed out along a track to which at one point turned into a coned roundabout to which you headed back the way you came. Not great but if you were close enough to the front and weren’t rude enough to talk while the organiser gave a briefing you would of heard about it. This led you back to a track into the grounds of the estate where you could see a lake and woods but wondered at what point you would be running through the woods as promised. The road/track section was approx 3 miles before you went off track. Chillington is not open to the public and the off road parts showed that. There was some parts that although grassed over you had no idea what was underneath. It was as I called it an Ankle turner of a section. More trails followed by crossing a field section and then through a wood and back towards the start. Not quite, I never looked at the mileage ran because if I did I may have been deflated. We turned a sharp right and headed over another field to start a slightly shorter lap two (this did have all the above mentioned off the road trail/grass/field sections) and thankfully felt shorter but obviously wasn’t. There were no hills to talk about and it wasn’t muddy. This is still a leg sapper of an event. Now there would be a few more photo’s about but Susan forgot to pack the memory card. For christs sake it’s all she had to do. Bob Wilson didn’t complete the full event but did 7 miles of it. After being injured recently he was doing the sensible thing. Thanks for your support Bob and Sue. Probably not but Chrissy and Sally said yes so if you like an event or not it’s really down to your own experience. The best way to find out is go and try it out. KP events organise this one, the same guys as Fradley 10k and Solihull 13.1 (ish) which I'd also entered and finished this year. All of there events seem to have a similar vibe, friendly, low key and mainly off in country lanes. Not really supported by our local clubs as usually clashing with more popular races. So as all of WRRs went off to Market Drayton I drove myself to Lichfield and parked up at a school. Walked over to a field where there were the ports loos.... 20 min queue and it was time to walk over to the start line. Some had taken part in the warm up. We were off, it was a hot day so I didn't want to go off too fast and tried to take it steady. Which was not hard as it was much more undulating than I had expected. Out in the country lanes it was difficult to keep out of the sun and I got a little bit burnt on the neck and shoulders. There were three water stations along the course. They seemed similar distances to the Solihull event. I can't quite remember on what miles they were on but I was glad when I was finally handed a drink. 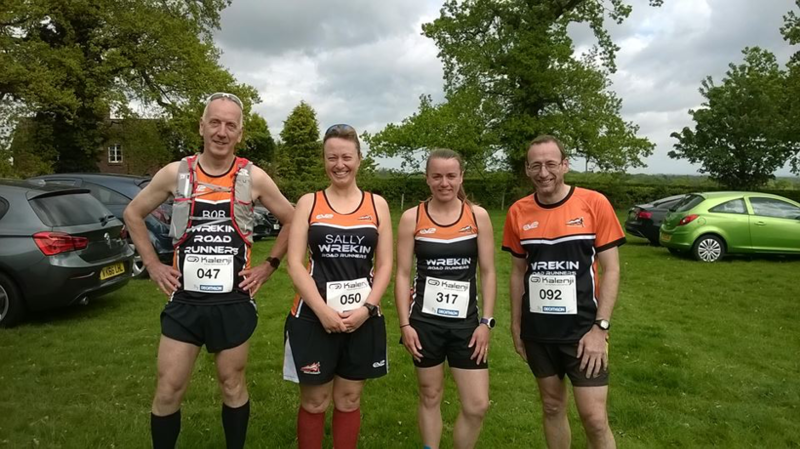 The only part of the course I was familiar with was when we ran through Fradley, as I'd run there twice before. There were some supporters there so that was nice. Mile 9 it felt like someone pulled my plug out and as I thought the heat had finally got to me. I got to mile 10 but it was a run/walk for the next 3.1 and just as I'd over heard it all seemed up!?! I saw one guy on various parts of the course who was obviously supporting his club, not sure how he got around so quick but he was always stood on a box so he could see and would always tell me how long in minutes before I would reach the finish line..... I think that was based on his running ability and was not helping me at all!! I was pleased the last km or so was actually slightly downhill and an older guy said he'd been running with me since mile 9 and I think he could see as I needed encouragement.. he was very sweet and tried not to over take me but I really had nothing left. ( chip time showed I was still in front). I thanked him for his encouragement. I was chuffed to cross the line and as like the other events you got into a queue for your water, medal, goody bag, twin and a banana!! And 12 energy gels, I'm sure that was a mistake.. I wanted to get to my car as I'd left my phone and money there and thought I'd get myself and ice-cream but I didn't recognise where I was. Anyone who knows me I skim read everything and the race started and finished 1.5 miles apart ahhh!! So after asking a few people if they knew how I get to my car was ( a few sarcy comments, of well I don't know where you parked!) and being told coaches could take me back, never actually saw one, I walked back with a couple of Italians who used google maps on there phone and I had actually remembered the postcode!?! Very pleased to get back to my car eventually after a 40 min walk. So if you like running on country roads with traffic on the other side, low key events with not much support. Ok medals no tshirt and not to badly priced then you may enjoy it.